Enjoying warm days in the Bay Area. 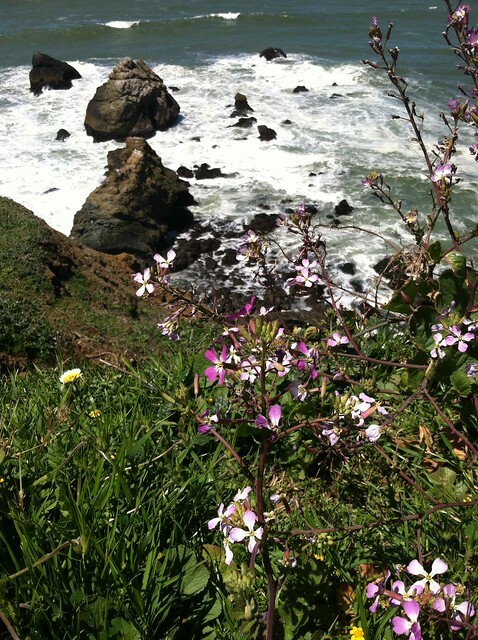 A walk by the Pacific at Mori Point. 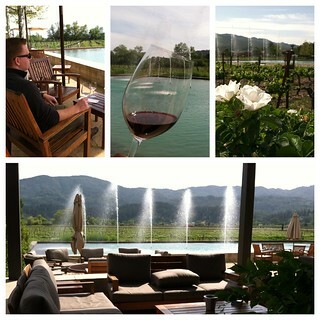 Wine tasting at Alpha Omega Winery in Rutherford. My entry for this week’s Photo Friday: Signs of Summer. Spotting green themes at work and abroad. From our meteorologist’s chroma key wall to Barcelona bar’s Clara. Our house is almost in order. I needed a break from unpacking. We watched the sunset at Fort Funston. I love having the beach in our backyard. My Friday included a brunch burger and bottomless mimosas at the Parkside Tavern. I discovered that a fried egg over a medium-rare chipotle beef patty is a yummy good thing. 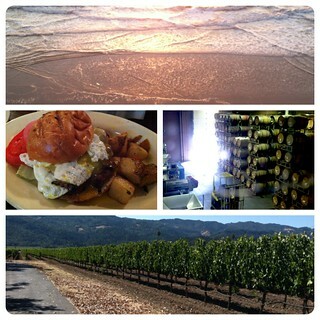 I also added some shots from our quick getaway to wine country in Napa. Counting down to our next adventure in Spain. I need to produce two more news shows. Then my vacation begins! Woot! Another sign of Autumn – fat, juicy grapes hanging on the vines. 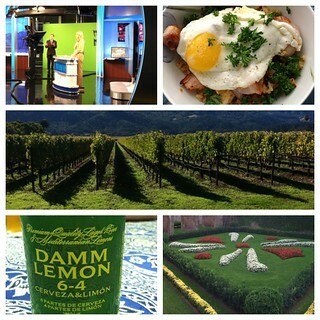 I snapped these shots by St. Supery in Napa. We watched winery workers crush Chardonnay grapes as part of its harvest season. Soon, these lush green leaves will change to gold. 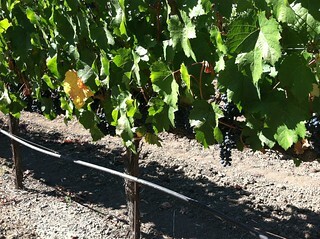 That’s when California’s wine country will bundle up for cold weather, sharp breezes and the beginning of Winter. I thought this would work for this week’s Travel theme: Foliage. 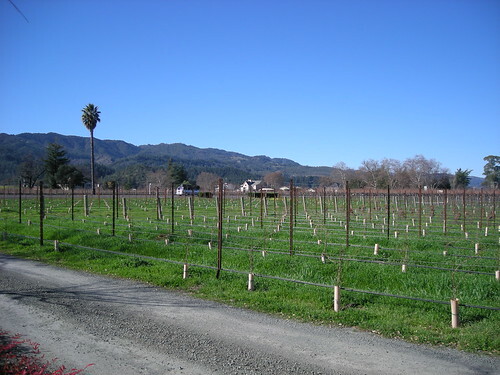 This is a typical sight in California’s wine regions: palm trees standing next to vineyards. These are vines at Peju, off Saint Helena Highway. It’s one of my favorite wineries in Napa. 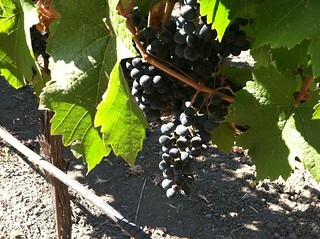 Hopefully this last round of wet weather will help local wineries avoid a dry season. 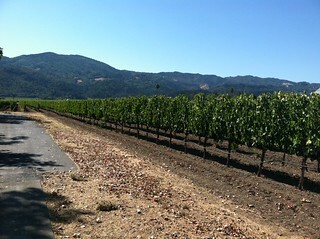 We love living next to the wine regions in the Napa/Sonoma Valley and Lodi. It’s a pleasure to discover new grapes and buy vintages that are not sold at Bev Mo and grocery stores. It’s also fun to introduce our friends to the smart and charming winemakers in these regions. Last month, we did breakfast with my Medill buddy, Sara, at the Bouchon Bakery. I’m a Thomas Keller fan and his macroons blew me away. 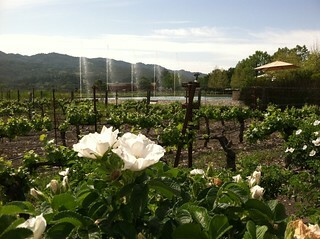 We also checked out Domaine Chandon (good wine, shoddy service) and Peju. I want to take my parents to Peju’s tasting rooms. I’m sure they will enjoy the bold reds and the entertaining wine experts. We also spent a relaxing Sunday in Lodi with Susan and Tom. Jessie’s Grove is our top winery in that region. Mark joined the wine club and we’re looking forwarded to picking up our next bottles from there. They had some tasty chocolate brownies to go with the port tasting. However, one of the cats devoured the sweet treats. Naughty kitties! We finished up our day with beer tasting at the Lodi Beer Company. Susan pointed out the beer flights felt refreshing in comparison to our extensive wine tasting at Jessie’s Grove. I suppose it was a nice change of pace. I like tasting wine on my weekends. What about you? How do you spend your weekends?